What are the best wood carving tools on the market? Unfortunately, there are so many tools on the market that choosing the perfect can prove a bit of an uphill task. 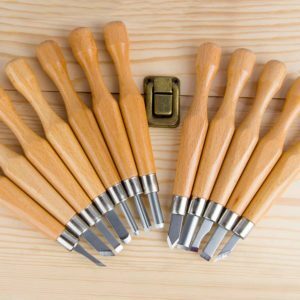 Every wood carving beginner needs tools that are gentle with their skills while demonstrating a high-level quality and this set of Gimars pretty much fits the bill. The kit contains 12 easy to use and durable tools that any beginner will find useful. These tools are sharp and will not need sharpening now and then – not many people are too fond of grinding on a frequent basis. 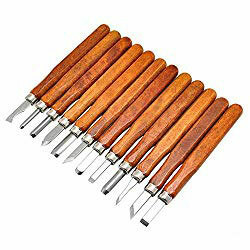 This might be the wood carving chisels for you if you are looking for cheap. The blade is SK5 carbon steel that will withstand the test of time and constant abuse. And what’s more, they come in different shapes and sizes to accommodate your carving needs. Some of the shortcomings of these tools include the need to maintain the blade – this pretty much applies to carbon steel items. This SIMILK 12 set has excellent ergonomically designed beech wood handles that make handling them such a breeze. You need not worry about scarring your hands in any way. The blades are SK7 carbon steel to easily withstand the rigors of constant abuse, hammering and being forced into the wood. The electrolyte coating ensures the blades move smoothly in and out of the wood. There are various tools with different edges to suit your carving needs. They can easily handle all types of basswood, softwood and pine, and pumpkin among others. To ensure their protection, the tools come with a great plastic cover. There is also a nylon case for easy transportation. 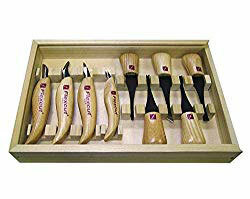 This is the wood carving kit for softwood. The blades can, however, break easily under constant pressure and so care is necessary. The edges will also need some occasional oiling and sharpening to ensure they are in good shape for your next project. This is a set of nine palm calving tools from a company well-known among the carving circles. Flexcut produces wood carving kit for beginners, and you may not go wrong with them. For starters, these tools come with an ergonomic handle constructed from ash hardwood. They fit perfectly in your hands, and all you need to worry about is the design of your next project. The blade in these tools is hard carbon steel and will not easily break under constant use. The edge may also stay sharp for longer. The tools come in an excellent wooden toolbox for their protection from the elements. You need not worry about misplacing the tools – they are all in a single box. Its shortcomings include the fact that they need a bit of maintenance after several uses to maintain their sharpness and durability. Some users have also complained of uneven edges. All in all, they are not too shabby a selection for beginners. 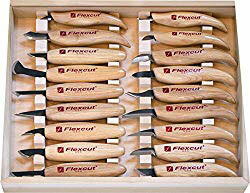 This Flexcut Palm set is yet another high-quality hand wood carving tools kit from Flexcut. However, this has a larger variety of carving tools, unlike others. There are five palm tools if you have some handheld projects and carving knives for a wider range of projects like relief carving. There is also three gouges, 1 V tool, and one skew tool offering you a wider variety of carving tools. All the tools are razor-sharp and ready to use right off the box. They are made of carbon steel, and you may not need to worry too much about breaking one tool or another. These tools also come with an ergonomic wooden handle that ensures your hands are free from blisters. Some of the shortcomings of this kit you may notice are that the box is poorly made and may get stuck once in a while. This is one of the woodcarving tools reviews I have ever written. Flexcut KN250 feature again with a more extensive set of wood carving tools. We can comfortably say that this is one of the most extensive collections of tools you will find under one box. As a matter of fact, there are 18 detailed knives to accommodate your every need. Each of these knives has a carbon steel durable blade that easily maintains its sharpness. They also have an ergonomic handle that is gentle in your hands ensuring they are blister-free. And for easy organization, the kit comes in a durable and well-constructed wooden storage box. These tools have a short neck, and that may make them unsuitable for projects with deep gouges and that requires a more in-depth reach. They may also need sharpening after several uses. Regardless, this is definitely one of the wood carving kits for beginners you can have. There are several things that you must consider when it comes to choosing the right one and among them are the many tools set. Going for a set is quite cheaper and convenient for you whether you are a beginner or a pro. A set saves you from the hassle of having to search for a particular tool individually. Another essential factor to consider is the construction. Ideally, carbon steel is much better in comparison to other types of metal. It is durable and maintains a sharp edge. Talking of sharp, always go for the pre-sharpened forms, and you will be alright. Ardent wood carvers will tell you how much satisfying it can be to create something aesthetically appealing on a block of wood. However, you need the tools for wood carving to stoke your creativity and try out that new design you have been thinking about all week. Having the wood carving tool sets can buy would mean nothing if you don’t know how to go about using them. For starters, your tools will need to be sharp that they don’t leave fault marks where they pass. You have probably heard that sharp knives are safe knives. Before you do anything, first determine the direction of the grains. Just take a moment and study the long cell fibers and the darker streaks will give you an idea. Every piece of wood has longitudinal cells that run from the roots to the canopy. Carving along the fibers is easier than going against them. You may notice you are going in the wrong direction if the wood keeps tearing and you are using sharp tools. Change the direction, and it will then be easier for you. If you have a wood carving knife, then you should hold it on the right hand and wood on the left – this is if you are right-handed. The left hand should then be behind the knife and the thumb on the blunt side of the knife. To make a cut, you move the wrist of the right hand, but the thumb should remain stationary. And for your safety, wear a glove on the left hand – the hand you are holding the carving with. This position is relatively safe, and you will avoid nipping your finger or palm. 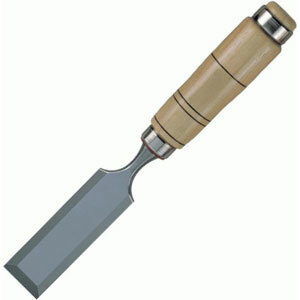 If using wood carving gouges, the handle should be in the palm of the right hand. While your right-hand push the handle, the left one should hold the metal shaft guide and control the tools. Your left hand is also responsible for keeping the device from slipping. Before you can move to the heart of the matter by using the detailed carving tools, remove as much waste as possible from the block of wood. Use a hand saw or power saw. You can then throw in other tools such as the larger gouges to remove as much material as possible. The goal is to make it easy for you as you will not have many scraps to deal with when going for that precise cut. Woodcarvers are always exposed to the risk of cuts. If you are a novice, always consider wearing a glove on the hand, you are holding the sculpture. And always remember that a sharp tool is relatively safer than a dull one. A flat knife causes you to exert more pressure than is necessary and that can easily prove a safety risk. Any slips may lead to deep, ugly cuts that can easily be avoided. When using power wood carving tools, always wear a mask, and it will protect your lungs from the dust. Also, slivers of some varieties of the red cedar and western oak can cause an infection. If that happens, remove them within the shortest time possible and treat it. 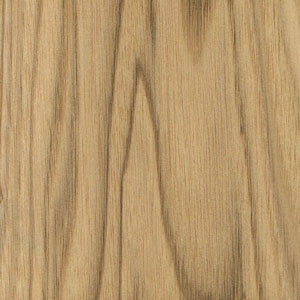 Many of the exotic hardwoods may be toxic causing an allergic reaction at the point of contact. If affected, seek medical attention and use safety equipment when handling the specific variety. Alternatively, you can switch the variety to the one safer for you. Whichever tool you are using, you need to learn to properly handle it before digging into a piece of wood. These are sharp objects you are working with; therefore, you need to be careful. Wear gloves on the hand in which you will hold the wood instead of the hand you will use the tool with. Use your wrist instead of the elbow to control the tool to get more accurate carvings. Before carving, find out the direction of grain by observing the long cell fibers. The dark streaks in annual rings will resemble the direction of the grain. Carve a piece of wood out of the corner to complete the cut to prevent the wood from ripping. Always make sure that you sketch out the woodcuts before the actual cutting. This will help you prevent mistakes which can’t be fixed. To carve efficiently, the tools you use should be razor sharp in order to get a clean and sharp cut in the wood. The cut should not lead to any white streak in the blade. You need to be cautious while handling the cutting tools as you may get seriously cut if you won’t be careful. Sharpening wood carving tools are essential for keeping all your blades in the best condition otherwise, you will have issues while working with them. The above information on shapes, sizes, and uses of the many available types of wood carving tools for beginners that will help you make a basic selection of equipment. I have made sure I share crucial wood carving information with you in the simplest way possible. At the beginner level, you just need a few tools. If you have the right knowledge and tools with you, the whole wood carving process will turn into an enjoyable experience! So whatever tool or wood you are working with for your project, take your time, be safe and have fun! If you have any comments or questions related to any of the points above, leave them in the comments below. I would love to answer them. If you like the articles and think that others will also find it to be beneficial then do share it. Are you interested in learning wood carving but don’t have any idea about any of the tools? Are you confused due to a large number of available wood carving tools? Do you want to know about each of the tools in details? Help is here! You have come to the right place. But before starting, beware, wood carving can be addicting!! Whether you fancy carving an intricate pattern on the door of the main entrance of your home or creating intricate designs on the headboard of your bed, you need to learn to use the wood carving set. You will learn about tools, wood, technique, and safety and hopefully, it will be sufficient enough to answer all your queries. Wood carving is the art of carving or fashioning out objects from wood with the help of a sharp hand-held tool. It is an art which you can’t learn overnight. It involves a lot of practice and patience. Once you start practicing, you will develop skills that will help you tackle any issue on your own. It is a relaxing and enjoyable activity, a great choice for anyone interested in learning a new skill. If you are interested in getting started with wood carving, then the first question coming to your mind must be what you need. In order to start, all you need is a creative flair and a good imagination. If you can look at a piece of wood and images of a wooden human figure, bird, cartoon, etc starts filling your head then you are ready to start! There are two basic things you need, a knife and a piece of wood. In the beginning, any good pocket knife will do instead of a fancy, expensive wood carving knife. To improve, what you really need is practice and tips from experienced carvers. It is a fun and creative craft which doesn’t require fancy studio or equipment. All you need is a piece of wood and a sharp object to carve it with. 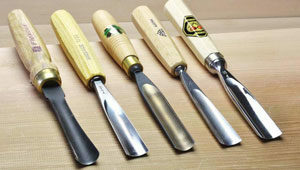 The type of wood and carving tools you will choose will depend on the difficulty level of your wood carving endeavors. One of the first things to think about when starting a woodcarving hobby is to have an idea of the different types of wood available for use. There are two main types of wood, softwood, and hardwood. While these two types of wood are suitable for woodcarving, beginners are advised to start with softwood since it is easier to work with. Balsa wood is probably the easiest type of softwood to carve. It is used mainly for creating wooden model planes and structures. A good number of local craft stores have balsa on their stocks for anyone who wants to start a woodcarving hobby. 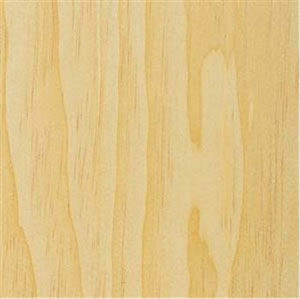 Basswood is another type of softwood suitable for woodcarving. It also features a creamy tint and a fine grain. Beginners can start with basswood since it is also readily available at many local craft stores and are sold at a reasonable price. 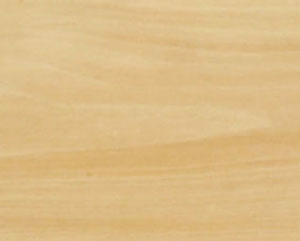 Pine is a common softwood species that can be easily shaped. While it is very soft, its grain is coarser compared to the first two types of softwood previously mentioned. There are two main types of pine, yellow pine, and Eastern white pine. 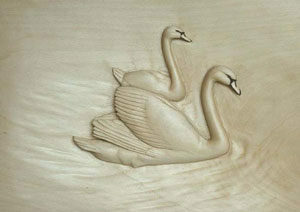 Even as it is suitable for woodcarving, it is not considered as unique as balsa or basswood. Pine is also readily available in many home centers in the country. While butternut may not be the easiest type of wood to work with for beginners, its results are considered more unique compared to the first four types of wood. Despite being soft and easy to work with, the coarse grain of butternut makes it a challenge to whittle without causing it to become chipped. Unlike the first four types of wood, butternut can only be sourced from a lumberyard. It is the best wood for wood carving. For all types of wood, it is necessary to use one that has no knots or growth rings. This may not be much of an issue if the material is bought at a local craft store. But, if it comes from a lumberyard, it may be a challenge to work with the growth rings of the wood. I am a wood lover as well as a woodworker. I find wood really beautiful and therefore I try to work it in a way that brings out its natural beauty. I have been carving wood for 9 or 10 years. At that time, I knew nothing about the woodworking and power tools. Now I have gained considerable knowledge about wood carving and the tools required for it. I also teach students the basics of wood carving. I have often seen students getting confused about the tools to be used for wood carving. There are so many wood carving tools. Students end up buying expensive tools which are not of much use later on. The tools you need will depend on the type of carving you will do, size and type of wood you will use. I have provided some of my useful tips and everything else you ever wanted to know about wood carving tools. Hopefully, this information will help you start your new interest in woodworking for pleasure, profession or hobby. Woodcarving may appear to be something simple to do, but it is important to take into account the different kinds of woodcarving techniques. These techniques may require the use of different tools and have different woodcarving results. There are four main styles of woodcarving: Whittling, Carving-in-the-Round, Relief Carving, and Chip Carving. Whittling is the art of carving shapes on wood using a knife. It is probably the oldest woodcarving style. It is highlighted by the sharp and textured cuts made by the strokes of the knife. 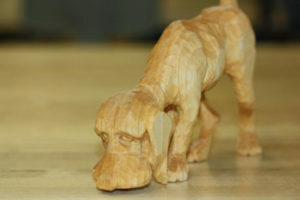 Wood sculptures are typically the products of whittling. The surfaces of these sculptures are not smooth. While most woodcarvers use a knife in whittling, a V-tool can also be used. Knives used by whittling may have either a fixed handle or a folding handle similar to a pocket knife. However, it is important to remember that not all pocket knives are designed for whittling since they are not meant to carve wood. Using ordinary pocket knives can be dangerous, especially if the wood is harder than expected. The handles of knives for whittling are thick to facilitate gripping for extended periods of time. It also allows better control and pressure while working on wood. 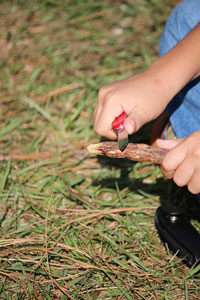 When whittling, it is important to make sure the wood is dry since it will be easier to whittle wood when it is dry. There is also the tendency for the wood to warp and crack once it dries up. It is also advisable to whittle with the grain or across the grain. When whittling with the grain, it should be done in a downward direction. Make sure your fingers are not in the path of the blade and when the blade gets stuck, move the blade back and try to backtrack. The blade may slip and cut your fingers when you try to push the blade against the wood. Remove the wood in thin layers and the blade should make a scooping motion. When the shavings are curled, it gives an indication that you are doing it right. This style of woodcarving can be likened to clay sculpturing since the products have a smooth surface and all the angles are rounded. This is where this woodcarving the style got its name. All the sides of the wood are also carved as compared to relief carving. While this woodcarving style may be similar to whittling, the products of carving-in-the-round are well-defined and have more details compared to whittling. This woodcarving style will require the use of tools other than a knife. To achieve the desired results, it is necessary to use chisels, gouges or other hand tools. There are also instances when it would be necessary to use power tools and different types of blades to create a product worthy of praise. Unlike the other styles of woodcarving where wooden sculptures are created, the products of relief carving have a flat back. While the figures may have three dimensions, the back of the wood is left relatively untouched. This woodcarving style is typically used to create scenes or figures of any subject and the product is used as a wall décor. It typically starts with a flat wood panel and a figure or scene is carved on it while the back is left untouched. The degree of the projection determines the type of relief carving. If the projection is under half-an-inch, it is a low relief carving. When the projection is between half-an-inch and two inches, it is a high relief carving. It is considered a deep relief carving when the projection is over two inches. Pierced relief carvings are carvings with holes going through the wood itself. 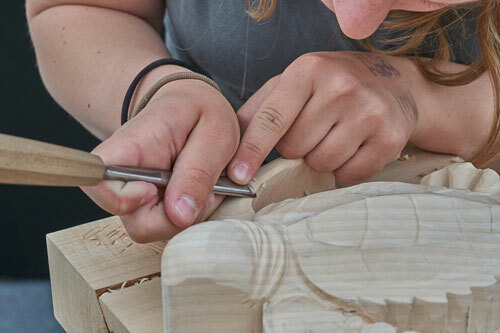 While hand tools are normally used in creating relief carvings, it is also possible to make use of power tools to quickly remove background material. Relief carving starts with the creation of a pattern on a piece of paper. The pattern is then transferred into the wood using carbon paper. Once the pattern is transferred, parts of the wood are removed from the objects. The objects are then modeled and details are added. After this, the background should be cleaned up before the panel is given an appropriate finish. Chip carving is a woodcarving style involving the use of knives or chisels in removing small chips of wood to create a pattern or design on a flat surface. Chip carving is relatively easy to learn. It is also the most popular style to start with for beginners since it only requires the use of a small number of tools. This style of woodcarving is used in decorating furniture, chests, boxes, utensils and other wooden surfaces. 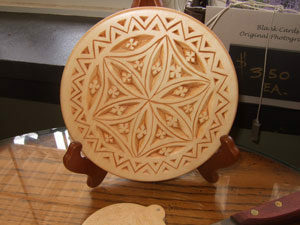 The patterns used for chip carving can be geometric shapes, like circles and triangles, or free form shapes. Even though this is the simplest style of woodcarving, it also requires precision and requires a considerable amount of practice, particularly when it comes to creating intricate designs. The first step in chip carving is the creating or choosing a pattern to use. After the pattern or design is selected, it will be necessary to transfer it to the wood. You can do this using a pencil, straightedge, and a compass. Since it will not be easy to transfer the pattern or design into the wood, you can find a copy of the pattern online and print it. Tape the printout into the wood and carve over it. But, it is important that all the details are accurate, which means it will be necessary for you to check everything to ensure you have the correct pattern or design. Wood carving can be as complex and simple depending on the carver’s requirement and preferences. An amazing piece of art can be obtained with the help of butternut or basswood carvings only with a simple chip-carving knife. Once you use a few gouges too, the range of possibilities for carving increases even more. A carving knife is the most basic tool to use in carving wood. It is mainly used by chip carving and whittling. The blade of the carving knife is typically one-and-a-half inch long with a handle that easily fits in one hand. The blade should be made of high carbon steel that is capable of maintaining its sharpness for an extended period. 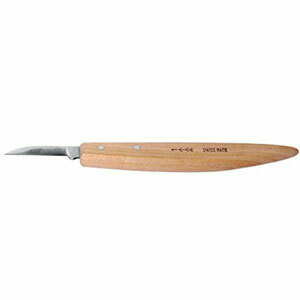 Chip carving knife is the most basic wood carving tool. It consists of a 1 and a half inch long handles created for comfort so it doesn’t hurt your hand. Gouges have round or curved blade used for scooping out small or large areas of wood depending on how large their sweeping area is. 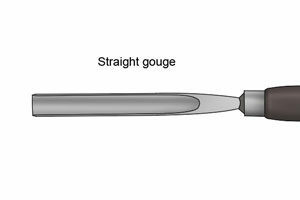 There are different types of gouges like spoon gouges, V-gouges, U-gouges etc which are used for shaping, carving and smoothing surfaces. The number of the gouge will determine the depth of the curve so a gouge with number 3 will be shallower than gouge of number 7. V-gouges are used in defining and separating specific areas in woodcarving. These tools are also called V-parting tools. They are labeled according to the distance between the angle of the bottom edge of the vee and the tips on the top edge. Sketches on the wood are typically made using v-gouges before the other types of gouges are used for shaping the wood. 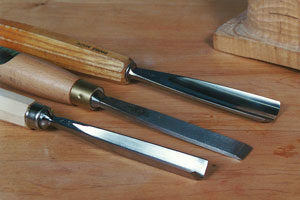 Straight gouges are considered as all-purpose tools in carving wood. The profile of the gouge determines its use. They can be used for the rapid removal of stock, providing surfaces a polished finish, and enhancing the detail of woodcarvings. Spoon gouges are mainly used for accessing hard-to-reach areas on woodcarvings. 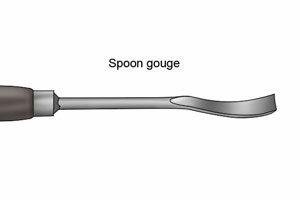 The blade of a spoon gouge is straight while its end is shaped like a spoon. 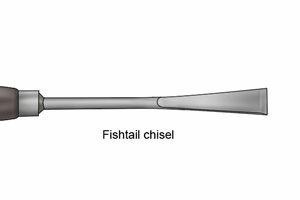 Fishtail gouges have a similar function as spoon gouges, but its flared edge allows woodcarvers to see more of their work since the metal does not impede their line of vision. These gouges are also used in accessing tight corners. While back bent or reverse gouges have a similar appearance to spoon gouges, the inner channel of the tool is sharpened. This means the cutting edge of these gouges are convex rather than concave. But, these specialized woodcarving tools are hardly ever used. 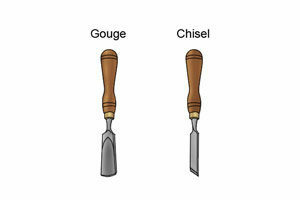 A chisel has a flat blade and comes in different sizes. These are the sharp tools which are to be used along with the mallets during wood chipping. A rubber mallet can be used in place of a wooden one on their chisel to lessen the noise and avoid excess wear and tear on chisel’s handle. Skewed chisel is where the cutting edge is angled away from the leading edge. A carpenter’s chisel is usually a flat-edged chisel that is mainly used to give crude-looking cuts into wood for specific types of sculptures. Since the flat edge of the chisel has the tendency to dig deep into the wood, it is only used for specific types of wooden sculptures. The edge of the chisel also has the tendency to go deeper into the wood than what was initially intended by the user. 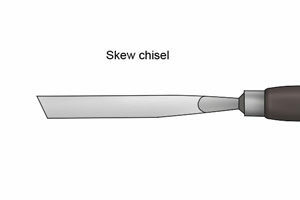 Skewed chisels are long, flat chisels with a beveled edge and an angled tip. These woodcarving tools have a similar function as a standard carpenter’s chisel, but they are capable of reaching into corners. 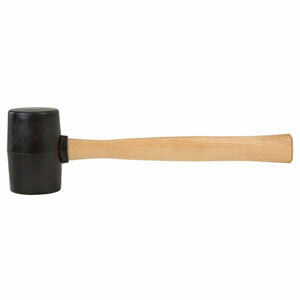 Mallet is popularly known as the woodworker’s hammer. It is round and can be made of maple or beech wood with an ash handle. Nowadays mallet made from urethane is also available which is almost indestructible. It is important that you chose a mallet which is easy and comfortable to hold as you will use it frequently. The mallet is used by tapping the cutting tool into the wood. A standard carving mallet is made of heavy hardwood and has a cylindrical shape. The type of work required determines the weight of the mallet to be used. Rubber mallets are designed to reduce noise when working as well as reduce the wear and tear on the handle of the chisel. However, rubber mallets do not have the same driving power as a wooden mallet. 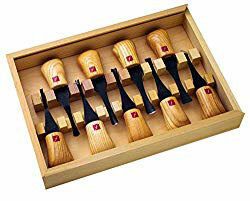 The Best wood carving set is a joy to use, and they help cultivate the carving desire. To choose the best one, you need to look for the carbon steel construction, ergonomic handle and those that come as a set. Basically, a set saves you from having to search for particular tools, and they are much cheaper as a set. The above review contains some of the ideal tools on the market, and you may not go wrong with any of them. However, Flexcut KN250 Deluxe Knife Set may be what you need to start off as a beginner. But that does not mean it is not suitable for beginners. Happy carving!